As I arrived for my weekly thrift-store scour, I saw the thing that most delights and alarms a thrifter: competition. A woman was standing over the pattern section (which was bulging), rifling through the patterns, basket beside her. And peeps, her basket was full. Of patterns. I checked out the rest of my usual spots—fabric, books, shoes—and wandered back. She was still there, still going through patterns. I hunted vainly through the bedsheets, but she was still there. Finally, I gave up and went over and wriggled my way in beside her. She was mostly going through the ones already in her basket. I tried hard not to look at her basket, not wanting the pain of knowing what treasures I had just missed out on. As I was sorting through the remaining patterns, another lady came and edged her way in beside us. This is a first ever, folks. 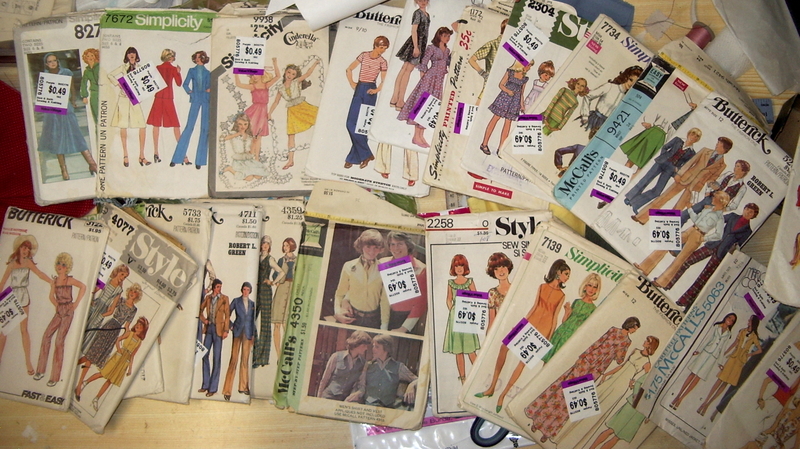 I wasn’t even sure that anyone else *ever* bought the Value Village patterns—I had gotten practically complacent, frankly. Anyway, despite getting the picked-over remains, I came home with a fairly massive haul. Not a lot of absolute gems, but some fun, quirky ones that I couldn’t pass up. And some more really cute kids’ clothes. The majority of the women’s patterns were in a size 6-8, however, which tempers my enthusiasm a little as that’s a fair bit of grading up. On the other hand, there was a man’s suit pattern (complete with the name of a designer I’ve never heard of), in a size 40 chest, which is my husband’s size—assuming we lived in some alternate universe where he would even remotely consider wearing a 70s-wide-lapel-bell-bottom suit. I have definitely crossed a perilous threshold, my friends. I am now officially a pattern collector—someone who buys patterns merely to *have* them, even knowing she will likely never make such a pattern (boys suits, eg.) It just has to be the right vintage, the right style. I’m pretty sure she walked away with a basket full of forties and fifties patterns. In factory folds. With a 34″ bust. And probably this one, too. Competition… Was she about your size? If she wasn’t it probably kept her away from the patterns which would have been perfect for you. In fact, I’ve had similar experience when buying vintage fashion and sewing pattern magazines on the local auction site: I have definately crossed into ‘collector’ territory now (so much so that my boyfriend has started telling it to friends as a ‘fun fact’ about me…) and although on many a lot, I am the only bidder, I have also seen several slip through my fingers because I was too complacent to bid quickly or to finish my considerations and get back about them fast enough when ‘talking’ to seller via email. And of course, sometimes I just don’t want to bid any higher. Oh boy.. that’s quite the haul. Your recent posts actually had me going to the local Goodwill (to be honest until I was in the parking lot I wasn’t sure who ran it, I just thought of it as a used clothing venue of some sort) to see if they even carried patterns. No such luck, bought fiction instead. Take a deep breath and walk a away from the pattern bin girly. ROFL ROFL I got a chuckle out of this post :O).